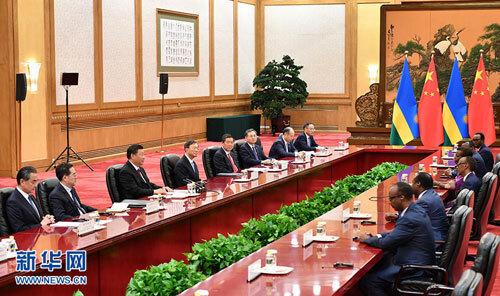 BEIJING, Sept. 4,Chinese President Xi Jinping on Tuesday met with Rwandan President Paul Kagame who attended the 2018 Beijing Summit of the Forum on China-Africa Cooperation. 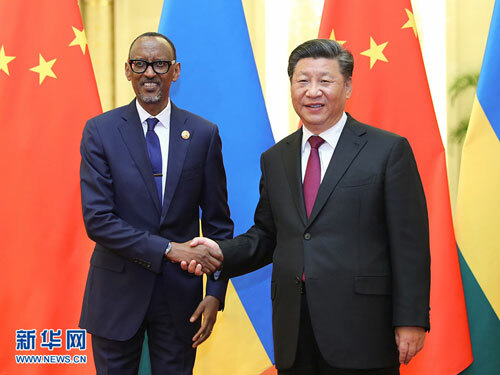 Calling the just concluded summit a meeting with historic significance, Xi expressed his appreciation and gratitude to Kagame for his attendance, also as the rotating chairperson of the African Union, and his contribution to the success of the summit. Xi said the African people's profound friendship with China was evident as so many African leaders had come to attend the summit. "We feel delighted and fulfilled to see a stronger China-Africa community with a shared future taking shape and growing," he said. Noting the important consensus reached during his state visit to Rwanda in July and the outcomes of the Beijing summit, Xi said the two sides should strengthen strategic communication, solidarity, and coordination, continue their mutual support, cooperate in Belt and Road construction, and enhance people-to-people and cultural exchanges so as to enhance the friendly cooperation. Kagame said the success of the summit has strongly boosted Africa-China ties. He thanked Xi for the great importance he attached to Africa and his important leading role in promoting Africa-China relations. With similar historical experience, Africa and China have a deep foundation in their relations. Being grateful for China's long-term support, Rwanda will remain committed to promoting the bilateral cooperation and Africa-China cooperation, he said. With China's support, Rwanda and Africa will achieve faster development, he said.